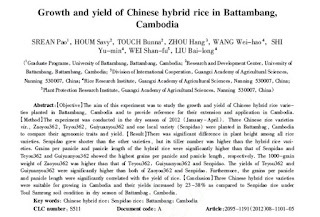 The aim of this experiment was to study the growth and yield of Chinese hybrid rice varieties planted in Battambang, Cambodia and to provide reference for their extension and application in Cambodia. [Method] The experiment was conducted in the dry season of 2012 (January-April). Three Chinese rice varieties viz. Zaoyou362, Teyou362, Guiyuanyou362 and one local variety (Senpidao) were planted in Battambang, Cambodia to compare their agronomic traits and yield. [Result] There was significant difference in plant height among all rice varieties. Senpidao grew shorter than the other varieties, but its tiller number was higher than the hybrid rice varieties. Grains per panicle and panicle and panicle length of the hybrid rice were significantly higher than that of Senpidao and Teyou362 and Guiyuanyou362 showed the highest grains per panicle and panicle length, respectively. The 1000-grain weight of Zaoyou 362 was hgher than that of Teyou362, Guiyuanyou362 and Senpidao. The yields of Teyou362 and Guiyuanyou362 were significantly higher than both of Zaoyou3362 and Senpidao. Furthermore, the grains per panicle and panicle length were significantly correlated with the yield of rice. 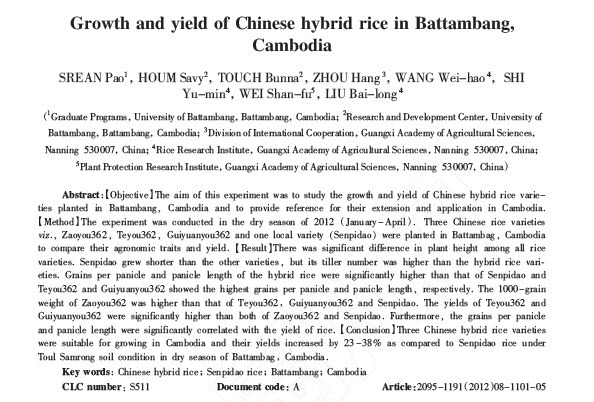 [conclusion] Three Chinese hybrid rice varieties were suitable for growing in Cambodia and their yields increased by 23-38% as compared to Senpidao rice under Toul Samrong soil condition in dry season of Battambang, Cambodia.